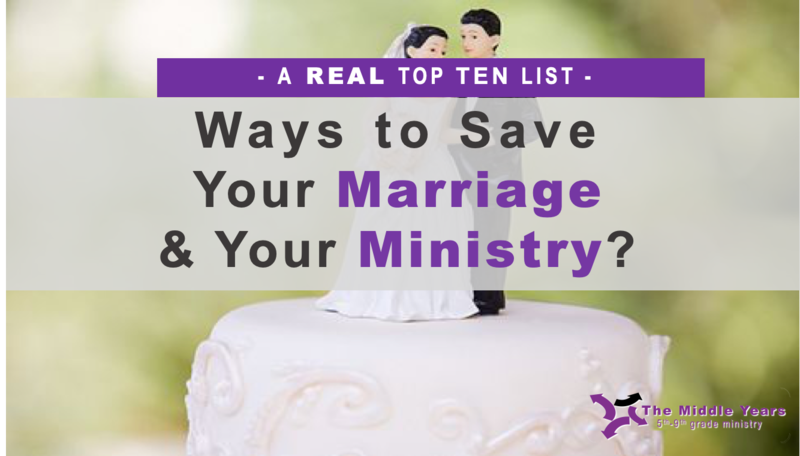 The Middle Years : Top 10: Ways to Save Your Marriage and Your Ministry? 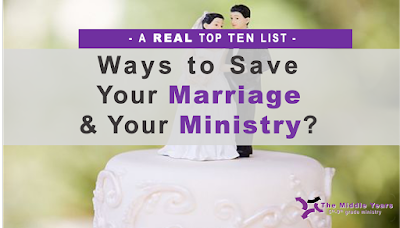 Top 10: Ways to Save Your Marriage and Your Ministry? 9. Have Fun- Enjoy and learn to laugh. Learn to laugh at yourself. 8. Be a Planner- Make plans and stick with them, what you say you will do...do! 7. Just Relax- Take and find time to relax, catch a breath, and just chill out. 6. Be Organized - Get and stay organized...A Day Planner & A Calendar! 5. Be Committed- Commit to the long haul and stick it out for better or worse....Longevity! 4. Live with Compassion- It is not just love, or even like.. It is both and really honestly caring. 3. Really Communicate- Don't talk at, talk to...a lot! 2. Be in the Scripture- Read it, believe it, make it the owners manual! 1. Have a Prayer Life- marriage or ministry, this is what is going to keep you going through the rough times.